What goes down in the studio, in the coordination between hand and eye, in the blending of passion and intelligence, in the urge toward meaning, generally has little to do with what goes down in art writing and academic discourse in the name of theory. Before there are words there are images, or objects or actions of one kind or another, and that’s been the case in the art of our time regardless of whether that art has been abstract or representational, modernist or postmodernist, installation or assemblage or performance or even conceptual. Yet there persist claims that painting in particular became persuaded during the last half-century to reduce itself to its essence because formalist critics had perceived purity as having been painting’s guide since the whole last century began. Thus did a perception of pictorial development become projected upon, and confused with, pictorial inent. Which is not to say formal issues don’t matter in the studio, far from it. As surely as images precede words, just as surely are formal issues bound to content, to enabling its articulation and earning its credibility, to testing and stretching its reach while acknowledging its limits and thereby tethering it to lived experience. In a modern world where all experience is problematic, those acknowledgments--of painting’s flatness, for instance--aim not inward to provide hermetic, self-indulgent, art for art’s sake contemplation, as we’re often told, but outward to provide frameworks for the expression of thoughts and feelings that we as beholders are in turn free to know, not in the way we know matters of opinion but in the way we know matters of fact, which is with the conviction that they are neither arbitrary nor merely personal but objective--and true. Don Voisine, Tumble, 2011-12, oil on wood, 60 x 32 inches (Alejandra von Hartz Gallery, Miami, FL). Don Voisine knows flatness. Having worked with it and in it and around it for more than three decades, he knows it not as an end but as a beginning, as a place to start. Which he initially grasped via drawings he made in 1980 when, as he says in a highly informative 2009 interview with Brent Hallard, “I began working with imagery derived from floor plans of places I worked in or lived in. It was an attempt to attach a subject matter to abstract shapes. The drawings were basically a quick sketch with marks to indicate the location of certain architectural features, doors, windows, stairs, etc...along the lines of what a carpenter might sketch out to visualize where certain things would go. Over time the paintings became more and more geometrically structured and less about a specific place but retained a reference to architecture.” In their structuring of fictive space and light, at once precisely limned and intuitively distributed, ordered yet felt, they referenced as well the experience of visually inhabiting such a world. While the process of achieving that effect may have begun with a strictly two-dimensional sketch, it has become realized in Voisine’s mature paintings by means that are altogether pictorial. Don Voisine, Full Stop, 2011, oil on wood, 28 x 22 inches (McKenzie Fine Art, New York, NY). From start to finish the process entails constant adjustments--in determining the saturation of the overlapping black geometric figures, whether matte or glossy, that dominate the center of the pictures; in paring down or building up their size and scale by altering their edges, which in turn necessitates accounting for their impact on the triangular white interstices exposed by the figures’ placement and rotation in the first place; in selecting hues for the coupled horizontal bands, thick and thin, that border the central area, top and bottom, and complete each composition. 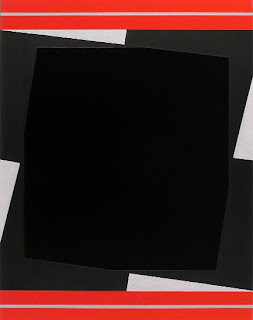 Don Voisine, Carré, 2011, oil on wood, 44 x 44 inches (McKenzie Fine Art, New York, NY). While each adjustment is undertaken to orchestrate and tighten the relation of each pictorial unit to every other pictorial unit, to secure formally the integrity of each painting as a whole, the overall effect of the process is also to enliven the space, to acknowledge its flatness while simultaneously allowing it visually to twist and warp and bend, to project and recede, to be positive and negative--and thus to explore and personalize what’s become natural to pictorial space since Cezanne and Cubism radicalized it more than a century ago. Don Voisine’s process yields painted worlds that are lucid and dignified, accessible and at the same time reserved, firmly balancing ideas and emotions in equal measure and appearing before us as metaphors for the worlds we fabricate as well as models for our being in them. His geometries offer stately reference to his membership among the American Abstract Artists, and they likewise reference individuals such as Mondrian and Malevich, but no less do they reach back to Ingres and Poussin and the western classical tradition in general. 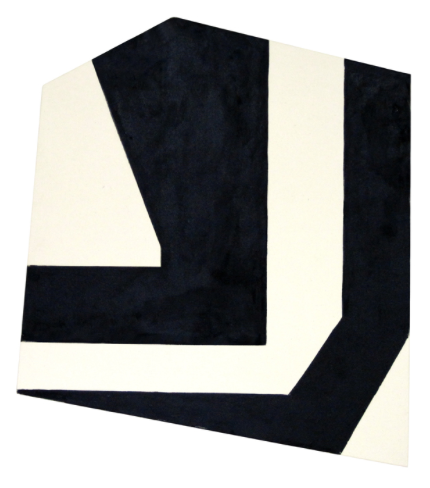 Ken Greenleaf’s geometries are of a different order. They’re mostly irregular polygons that combine only fragments of the geometries we’re familiar with, triangles, squares, rectangles and so forth, into hybrids whose radical abstractness strongly resists naming. They’re also restless, constantly jostling and probing the flattened spaces they occupy, interacting with and against them, and energizing them in the process. And finally they’re pretty clearly worked by hand, whether in acrylic on raw canvas, charcoal collages, or oil pastels, which in each case imparts to them an aura of physical presence that in turn heightens their immediacy. I think Greenleaf’s welded steel sculpture, on which he focused his studio practice for most of three decades starting in the early 1970s, here becomes relevant. Fully abstract like his paintings and drawings, it everywhere comprises planes and armatures that literally as well as visually overlap or splay and angle into space in order to frame or extend it. Such shared effects tempt us to account for the paintings and drawings by appealing to the sculpture, a reasonable gambit for a stylistic analysis, but only insofar as we’re willing to also allow that the paintings and drawings equally reveal how essentially pictorial the sculpture was in the first place. What I’m suggesting is that Greenleaf’s current work represents a defining aspect of his artistic enterprise and persona, one that’s been there all along but has only become foregrounded with his shift from a three-dimensional art to a two-dimensional art. Which is another way of saying his art has become more fully his own. 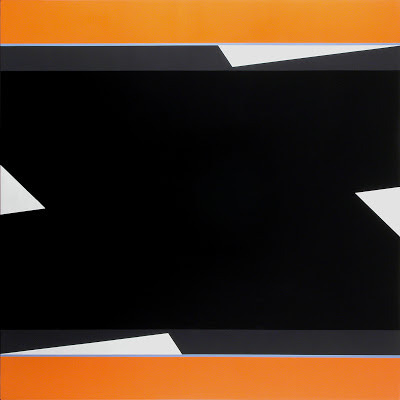 Ken Greenleaf, Alea, 2010, acrylic on canvas, 26 x 23 inches. In probing and jostling and energizing space, Greenleaf’s hybrid geometries generate pictorial worlds in which flatness and depth hover together in dynamic yet ambiguous and even contradictory couplings. 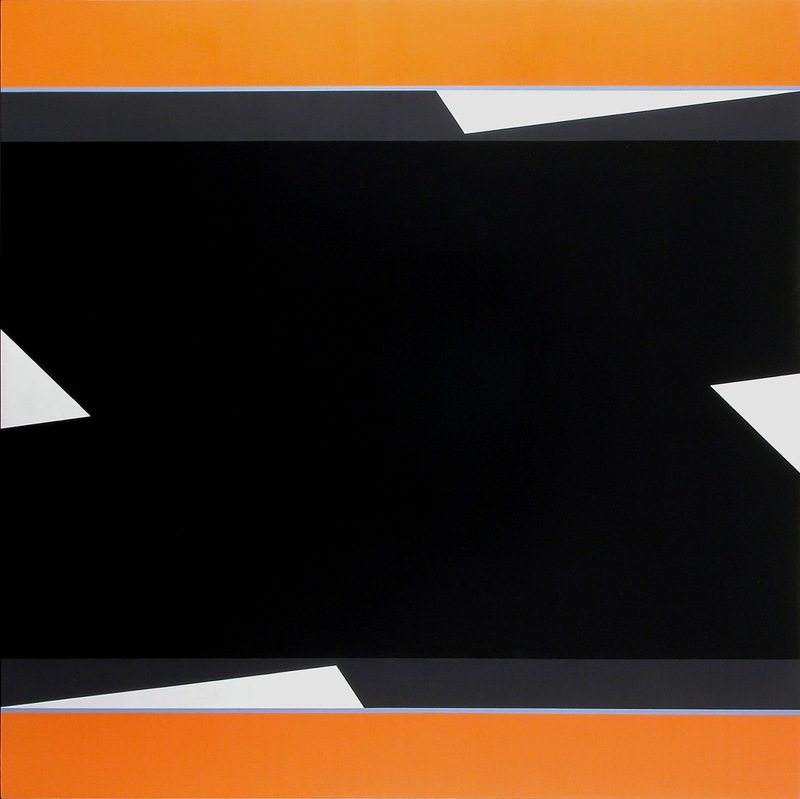 His exploration of the challenges and resolutions of those couplings begins with the 2010 acrylic paintings, which mostly comprise irregularly shaped single masses positioned within irregularly shaped canvas supports, the relationships between them suggesting constant optical shifts between flatness and depth, solid and void, interior volume and contour. 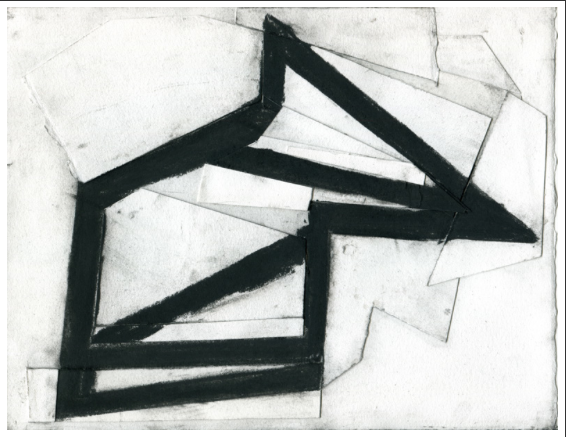 Ken Greenleaf, Blackwork 8, 2012, charcoal on paper, 8 ½ x 11 inches. 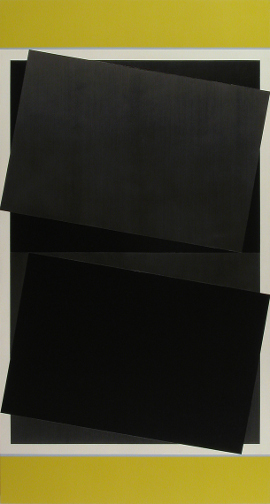 The charcoal collages that follow are more loosely and immediately articulated, still basically flat but more visibly physical, more painterly; they appear to have pried open the singular masses in the paintings to expose the complex angled framework within them, as if to reveal them in the process of becoming. Ken Greenleaf, Gauge 33, 2012, oil pastel on paper, 8 ½ x 11 inches. 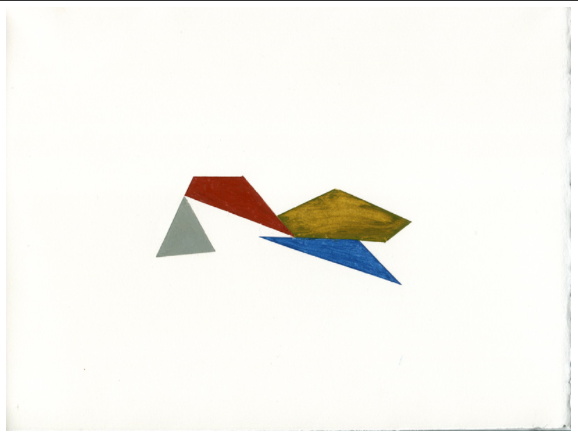 Most recently, color appears for the first time in the oil pastels in which mostly scalene triangles and irregular quadrilaterals float weightlessly in space, delicately touching and occasionally abutting while tilting this way and that, their expansive scale utterly surprising in relation to their diminutive size. Together the series thus offer an impressive range of ideas and feelings, their very fecundity suggesting a breakthrough of some kind to an aspect of Greenleaf’s artistic self that became fully accessible to him, and to us in turn, only when he confronted painting directly and experienced the exhilaration that attends exercising its freedoms in concert with its limitations. Don Voisine and Ken Greenleaf. Linear and painterly. Intellectual and emotional. Idealism and realism. Being and becoming. Classical and Romantic. I invoke Heinrich Wolfflin here, along with the sweeping generalizations of art’s larger history, and in doing so I take liberties with both artists. But I do so not to contextually aggrandize them, only to suggest that what goes down in their studios, which is the art of modernist painting, is perhaps larger and more expansive than art writing and academic discourse in the name of theory sometimes lead us to believe. Carl Belz is Director Emeritus of the Rose Art Museum, Brandeis University. This is such a smart, thoughtful, human-centered essay. I am always a fan of Carl's thinking and writing, and this is one of my all time favorites. I am sharing this wherever possible.